Home / ‘Bio-duck’ sound mystery solved! For a half century a sound heard in the Southern Ocean and beyond has baffled acousticians. The noise – nicknamed “the bio-duck” – appears in the winter and spring. 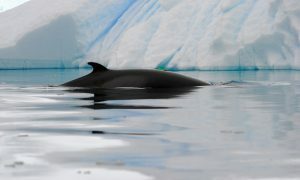 The repetitive, low frequency noise has been recorded many times in the waters around the Antarctic and western Australia. Our paper has solved the mystery and opened many questions about the source – the minke whale!